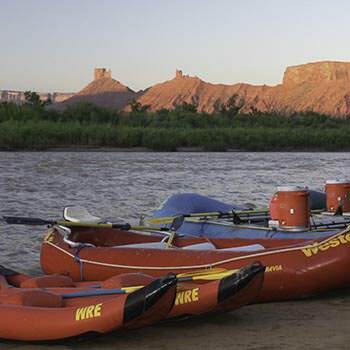 The types of rafts and boats you'll be using on your Moab, Utah Vacation on the Colorado River are explained in detail below. Being a "sampler" trip, it should be no surprise that there's a great variety of boats. The ride and adventure level between the Oar-Rig, the Paddle Raft, and the Inflatable Kayak. Each one offers a very unique experience. The best part of the Moab, Utah Vacation Sampler is that the Colorado River though this section is not only one of the most famous and scenic, but the rapids are perfect-sized for, well, getting your feet wet! The largest rapid you'll find in this stretch of Colorado River is only a class III rapid. You can learn more about how rapids are rated here. Western's Oar Rig Raft is typically 18 feet long, and handles both cargo and a comfortable ride for up to 6 guests. The guide does all the work of steering and propulsion with long oars. Make your guide proud and don't refer to the oars as "paddles"! These specially designed boats are “self-bailing” which means that any water that comes into the raft immediately flows back out. Western also has paddleboats which provide “hands-on” excitement in conquering the waves with a spirited team of 6 to 8 rafters. Paddlers need not have any prior experience as Western’s guides will provide ample instruction and ensure everyone’s success. Mostly referred to as a “duckie” or “duck,” these two-person inflatable kayaks let you challenge the rapids on your own. They also provide a peaceful and relaxing way to recline and gaze up at the spectacular scenery in the calm stretches of river. If you’ve never paddled before, acquiring some basic paddle skills with the help of a guide takes only a few minutes. Inflatable kayaks are available throughout the trip and guests can take turns enjoying the ride.